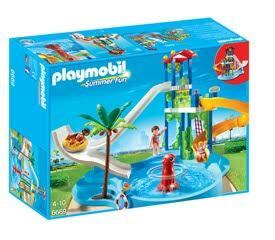 Summer is heating up and there’s no better way to have fun in the sun than with PLAYMOBIL‘s NEW Water Park with Slides playset, a colorful, creative, high quality playset for lots of imaginative play. Great for outdoor use, this playset includes two jumbo slides for the figures to slip and slide their way down to the wave pool! Take a break from the summer heat and fill the wave pool with water, watch the octopus come alive and create ripples throughout the pool for the ultimate splash of fun! Get ready for a sun-sational time. This set is great indoors and out. It’s a breeze to set up, and doesn’t take much water to fill. It comes with two jumbo slides, one regular and one for tubing. This way, Playmobil kids can slip and slide their way down to the wave pool at the bottom and play there as well. The octopus in the middle spins, creating fun ripples throughout the pool. When ready to take a ride down the slide, use the park’s pulley to pull the tube up to the top of the slide. Just be sure to wait until the pink octopus gives you a green smile for heading down the slide. 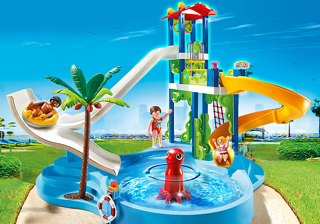 Set includes two adult figures, one child figure, multi-level structure with slides, tube, life ring, and more. If you would like to enter to win one of your own, please feel free to enter using the RC form below. Good Luck! Ends Aug. 19, 2016. I would give this to my youngest niece. i would give this to our daughter. she will love it. I will be giving it to my friends niece for her birthday. I will give this to my youngest nephew. Thank you for the chance to win. I will give this to my kids. I’d give this to my kids 🙂 They have one Playmobil set already and they love it. This one looks like a lot of fun too! I would give this to my little nephew he would love it. I would give this to my niece. She would have so much fun with this. I would give this to my grandson. He loves water play, and would have so much fun with this. If I won I would give this to my granddaughter! I will give this to my 4 year old son who just saw this toy review and loved it! I would give this to my middle son. He would love it! I would love to win this for my son. He would enjoy playing with it. I’d give it my kids. What a fun play set! i would give this set to my little grandson. I have a favorite nephew who would get it. I would love to surprise our little cousin with this! I’d love to win this for my nephew. Alec. Thanks.